In tropics area where high rainfall and strong winds like Indonesia, the roof of the house must be designed and calculated to drain water easily. In some areas with low rainfall, it tends to have a less steep of roof pitch. For snowy areas, the roof must be able to withstand the weight of snow that piled up and sloped enough so that snow can fall easily. Simple roof design usually has smaller leak then complicated roof design. Because complicated roof design has more connections that usually tend to leak. Too steep will make complecated installation and shingles will be fallen, and not easy to climb. Less steep would cause the rain water splashed, especially when heavy rain and wind with the wind direction right from the front of the roof. The angle can be a bit more lower if tile is wider and longer. 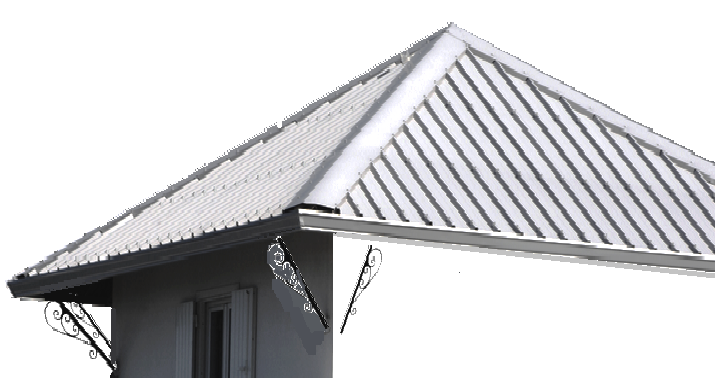 If you want a steeper angle then you should use a metal roof which is screwed into a light steel frame to avoid tile falls easily. Tile roof in the photo below is actually already meet the standards slope. But because of the high wall next to the tile roof, it raise rain water flow on tiles. If rain falls at a certain angle and hit on that high wall surface, then high flow water will go down onto tile roof. The tile should be constructed with steeper angle or using longer tile to make fewer holes for water to enter. But sometimes that high wall was built after the tile roof was finished, such as the house in the above photo. As a solution it can use waterproofing paint such as Aquaproof for wall that is connected to tiles. Add fiber to close the gap between roof tiles and wall, the fiber is then covered by waterproof paint. Painted every 6 months or once a year, or if any water droplets on the wall below roof tiles. In the photo above shown waterproofing paint with gray color. Using carpet to cover wall-tile connection also can help, but the carpet is easily separated when high wind and can suddenly leaked badly when windy rain. Carpet also look less tidy if compared to waterproof paint. 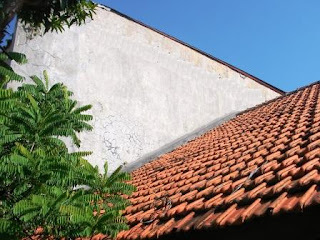 Due to the high flow of rain water on roof tile that close to roof wall, as a result of rain water from high wall gathers with rain water from roof tiles, then small cracks on roof wall can cause leaks. Widen the roof wall surface by adding cement can also help, because the cement will close the gap between roof tiles and roof wall. Cement used should not be mixed with sand, because cement mixed with sand will easily crack. Widen the roof wall surface with zinc plate or plates aluminum long and flat (not corrugated) can also help, in order to close the gap between roof wall and roof tiles. Zinc or aluminum plate which also called as flashing, must be cemented to roof wall to avoid easily blown off when high wind. Too steep will complicate installation, the longer the eternit or zinc, less pitch angle is allowed. Zinc and eternit have a tighter joint than tile, so less likely to leak. Eternit are quite economical, less heat conductivity, and not noisy when raining like zinc roof, so it is quite popular. Eternit has longer lifespan than zinc roof. Eternit can be painted for better look with exterior paint or roof paint. Metal tile roof and lightweight steel trusses are very popular today. Metal tile and lightweight steel trusses theoretically will not rust and damage by age, except when hit by heavy objects, blown by hurricanes and other disasters. This roof can be easily constructed, and economical. Unlike wooden roof truss that is not easy to built and vulnerable by termites. Metal tile roof can be fastened with screws to avoid open easily, or fallen if the pitch angle is too steep. A wide selection of tiles and colors are available in the market. Therefore, the roof is becoming very popular today. The length of the roof can be made continuously without any connection, each sheet can be fabricated to suit roof design length. There are innovations that do not use bolts, but using a kind of metal clip that attaches to the roof from below, the clip is mounted on roof frame. There is absolutely no screw hole on metal roof with clip. Seamless metal roof is claimed by the manufacturer can drain water with less than 10 degrees slope. Metal roof can be painted for better looks. 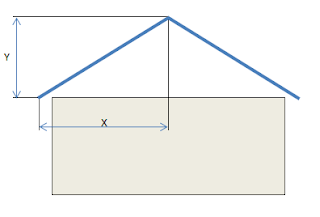 An easy way to measure the roof pitch angle is to measure the horizontal distance (x) and vertical distance (y) of the roof, then use tangensial formula to determine angle. If you have difficulty to measure the dimensions of the roof as shown above, the angle of slope of the roof can be measured from a distance without the need to climb onto the roof to measure. Measurement is using simple tools such as cardboard and string but the result is quite accurate. Please read in the article "Easy Way Checking Roof Pitch Or Slope". Roof pitch is important for building construction . With the help of this blog very easy to calculate roof measurements for build the house. Thank you for your visit, Heru.